Hani Ar Rifai is born in the city of Jeddah, Saudi Arabia, Sheikh Hani Ar-Rifai is the Imam and Khateeb of Masjid Anani in the same city. During his learning of the Holy Quran, the esteemed Shaykh has had the privilege of being in the company of and attaining knowledge from other well-known Shuyookh such as Shaykh Muhammad Ibn Abdu Rahim Achichin, Sheikh Ali Jaber and Sheikh Muhammad Yusuf. He completed his specialisation in Islamic Studies at King Abdulaziz University and sought education at the behest of the best scholars and sheikhs such as Shaykh Al-allamah Abdullah Bin Bayyah, Sheikh Khaldoun Al-Ahdab and Sheikh Ali Jaber to name a few. 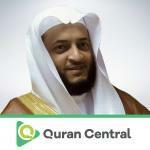 Owing to the emotional and soul warming rendition of the Book of Allah, Sheikh Hani Ar-Rifai was elected as a special reciter of the Holy Quran in the Royal Court by the Saudi Ministry of Culture and Information. He was granted the coveted designation as the Director of the legal affairs of King Faysal’s Hospital and the Research Center in Jeddah.